Common Name: Swallowwort root, Blackened swallowwort root. Part Used & Method for Pharmaceutical Preparations: The roots, or rhizomes, are gathered in autumn and dried in the sun. Properties & Taste: Bitter, salty and cold. Functions: 1. To clear heat and cool blood; 2. To benefit urination and relieve urinary tract infection. 1. Internal heat and deficient yin manifested as afternoon fever and night sweating or as febrile disease due to exogenous pathogenic heat at the nutritive and blood levels and accompanied by sustained fever. Swallowwort root (Baiwei) is used with Wolfberry bark (Digupi) and Fresh rehmannia root (Shengdihuang). 2. Postpartum fever caused by deficient yin. Swallowwort root (Baiwei) is used with Ginseng (Renshen) and Chinese angelica root (Danggui). 3. Boils, carbuncles, sore throat and snake bite. Swallowwort root (Baiwei) is used externally and internally. 4. Urinary tract infection manifested as heat syndrome or bloody urine. 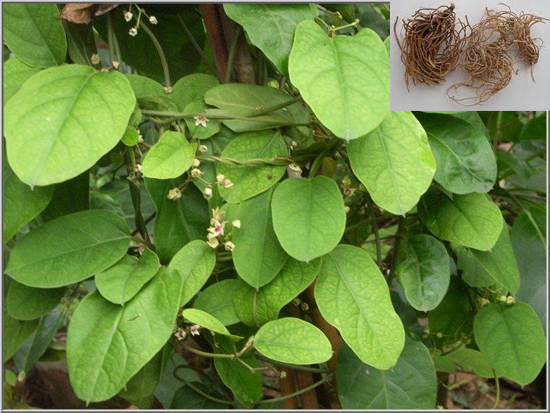 Swallowwort root (Baiwei) is used with Lophatherum (Danzhuye), Clematis stem (Mutong) and Talc (Huashi). Dosage: 3-12 g, decocted in water for an oral dose, or made into a bolus or powder.